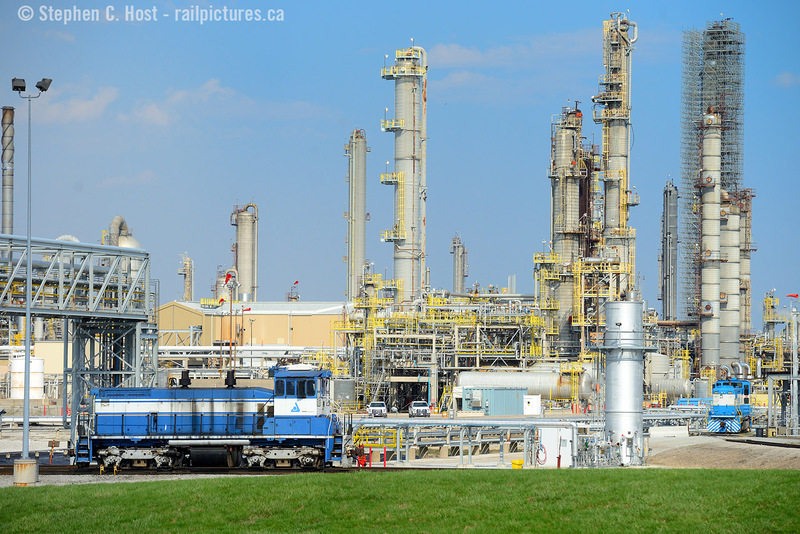 Railpictures.ca - Stephen C. Host Photo: At Nova’s Mooretown site, two switchers sit idle as the day has ended. The first far in the background is NCLX 2003, a MPI MP1500D and fairly new (last 10 years?). The one up front, it probably has a number but I can’t see it in this picture is an older SW of some kind. Each Nova plant has two switchers, for a total of about six in the area, but only one plant is shootablefrom public property. This is along HWY 40 toward Chatham. | Railpictures.ca – Canadian Railway Photography – photographie ferroviaire Canadienne. Caption: At Nova's Corunna site, two switchers sit idle as the day has ended. The first far in the background is NCLX 2003, a MPI MP1500D and fairly new (last 10 years?). The one up front, it probably has a number but I can't see it in this picture is an older SW of some kind. Each Nova plant has two to three switchers, for a total of about six top eight in the area, but only one plant is shootable (today) from public property. This is along HWY 40 toward Chatham. Note that NOVA plans a $2 Billion expansion adjacent to this site, and at the Moore site (construction is underway) with planned rail yard and track expansions. See here for more if interested. The foreground SW..could it be a 1500? The trucks are like those on the CN SW1200RS’s, the spark arrestors are a mystery..